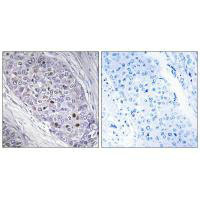 Immunohistochemistry analysis of paraffin-embedded human breast carcinoma tissue, using MEF2C antibody. 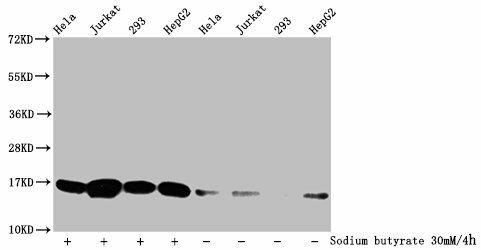 Immunogen Synthesized peptide derived from internal of Human MEF2C. 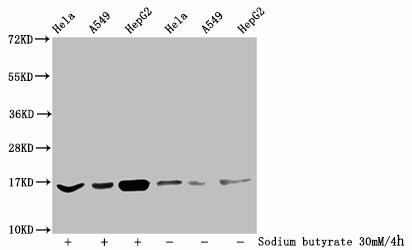 Specificity The antibody detects endogenous levels of total MEF2C protein. 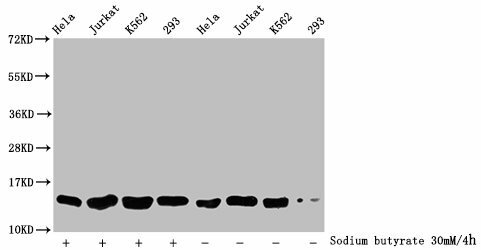 Relevance Transcription activator which binds specifically to the MEF2 element present in the regulatory regions of many muscle-specific genes. Controls cardiac morphogenesis and myogenesis, and is also involved in vascular development. Plays an essential role in hippocampal-dependent learning and memory by suppressing the number of excitatory synapses and thus regulating basal and evoked synaptic transmission. Crucial for normal neuronal development, distribution, and electrical activity in the neocortex. Necessary for proper development of megakaryocytes and platelets and for bone marrow B-lymphopoiesis. Required for B-cell survival and proliferation in response to BCR stimulation, efficient IgG1 antibody responses to T-cell-dependent antigens and for normal induction of germinal center B-cells. May also be involved in neurogenesis and in the development of cortical architecture By similarity. 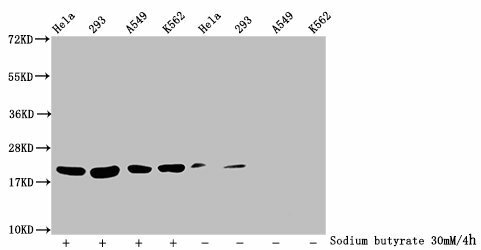 Isoform 3 and isoform 4, which lack the repressor domain, are more active than isoform 1 and isoform 2. Leifer D., Proc. Natl. Acad. Sci. U.S.A. 90:1546-1550(1993). McDermott J.C., Mol. Cell. Biol. 13:2564-2577(1993). Wang A.H., Mol. Cell. Biol. 19:7816-7827(1999). 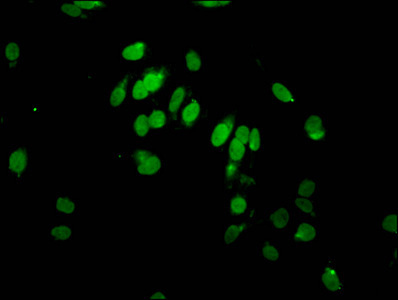 Function Transcription activator which binds specifically to the MEF2 element present in the regulatory regions of many muscle-specific genes. Controls cardiac morphogenesis and myogenesis, and is also involved in vascular development. Plays an essential role in hippocampal-dependent learning and memory by suppressing the number of excitatory synapses and thus regulating basal and evoked synaptic transmission. Crucial for normal neuronal development, distribution, and electrical activity in the neocortex. Necessary for proper development of megakaryocytes and platelets and for bone marrow B-lymphopoiesis. 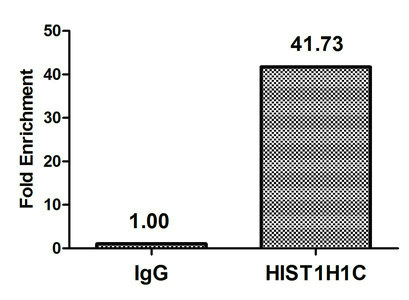 Required for B-cell survival and proliferation in response to BCR stimulation, efficient IgG1 antibody responses to T-cell-dependent antigens and for normal induction of germinal center B-cells. May also be involved in neurogenesis and in the development of cortical architecture (By similarity). 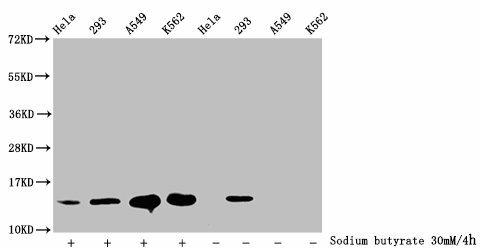 Isoform 3 and isoform 4, which lack the repressor domain, are more active than isoform 1 and isoform 2. Tissue Specificity Expressed in brain and skeletal muscle.